Tailor-made for top-down thrills, the Mazda MX-5 Miata is an automotive masterpiece that delivers on the promise of exhilarating performance in a nimble, convertible package. With the arrival of the 2018 Mazda MX-5 Miata in Las Vegas, NV, automotive connoisseurs will enjoy a wealth of style, performance and technology upgrades. When you pair an affordable price tag with track-tuned performance, there are few models that can compete with the Mazda MX-5 Miata at Earnhardt Mazda Las Vegas. When the 2018 Mazda MX-5 Miata arrives at dealerships, it will be available in three well-equipped, performance-tuned trim levels – Sport, Club and Grand Touring – that will start at just $25,295 when you opt for the convertible soft top. Drivers who opt for the Mazda MX-5 will have a choice between a convertible soft top and a hard-top convertible Mazda MX-5 Miata RF that is available in Club and Grand Touring grades. If you are looking for a stylish and performance-tuned two-passenger sports car, the Mazda MX-5 Miata will check all the boxes. Are you looking for a nimble, fun-to-drive convertible sports car? 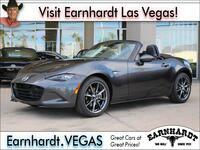 Look no further than the 2018 Mazda MX-5 Miata in Las Vegas, NV. Under the hood, the Mazda MX-5 Miata employs a 155-horsepower 2.0-liter SKYACTIV®-G four-cylinder engine that can be paired with a six-speed SKYACTIV®-MT manual transmission or a six-speed SKYACTIV®-Drive automatic gearbox that send power to the rear wheels. When equipped with the automatic transmission, the Mazda MX-5 will earn 26 mpg in the city and 35 mpg on the highway. New to the 2018 Mazda MX-5 Miata spec sheet, car shoppers will have the opportunity to add an exclusive Dark Cherry or Black soft top that can be complemented by new Auburn leather interior. Exterior color options will now include Soul Red Crystal, Machine Gray Metallic Eternal Blue Mica and Snowflake White Pearl Mica. An all-new Brembo/BBS Package is available for the Mazda MX-5 Club that will add heated seats, black leather interior, aerodynamic upgrades, 17-inch BBS wheels, and Brembo front brakes. Drivers who opt for the new Brembo/BBS RECARO Package will substitute black leather front seats for heated RECARO front seats. If technology is at the top of your automotive wish list, a standard MAZDA CONNECT™ infotainment system with a seven-inch touchscreen display sets the bar high in Mazda MX-5 Miata Sport variants. Available interior upgrades include a BOSE® nine-speaker sound system, Nappa leather interior, heated front seats and much more. Safety is an added asset of the Mazda MX-5 Miata design that gets an upgrade with available Blind Spot Monitoring with Rear Cross-Traffic Alert, an Adaptive Front-Lighting System and Lane Departure Warning. 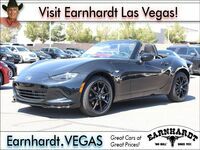 Visit Earnhardt Mazda Las Vegas today to get behind the wheel of the 2018 Mazda MX-5 Miata! Interested in a Mazda MX-5 Miata?